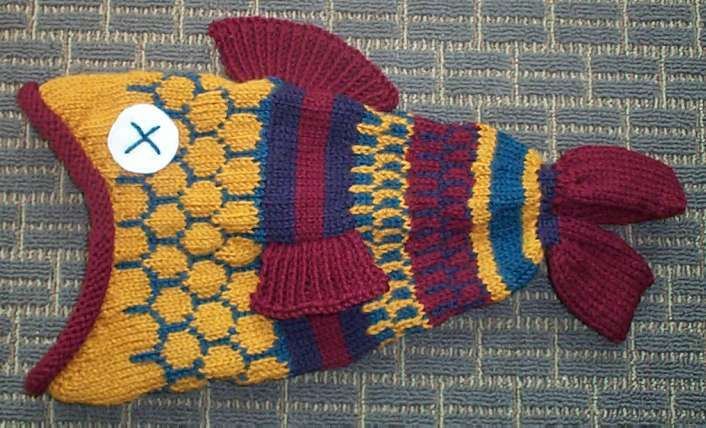 The latest fish is finished – all ended off, seamed, and eyes affixed. The recipient is thrilled. So am I. I usually don’t like making more than one of anything. I even hate that inevitable second sock, mitten, or sleeve. Exceptions to this are rare. I did four of these fish. It makes my short list of multiple project patterns, right up there with the Wonderful Wallaby sweater (five, for my own kids plus some nephews/nieces); the Ridged Raglan pullover (two, one for my kid and one for a niece); the Cabin Fever 1,2,3 Top Down pullover (for a work pal’s kids); plus several Kombu Scarves, and several Kureopatora’s Snake Scarves. Note to self – I should dig out a couple of the Wallabies to write about here. The colors on the shot above are truer than the ones in my previous photo, which made the thing look particularly dark and gloomy. Blame sunlight. 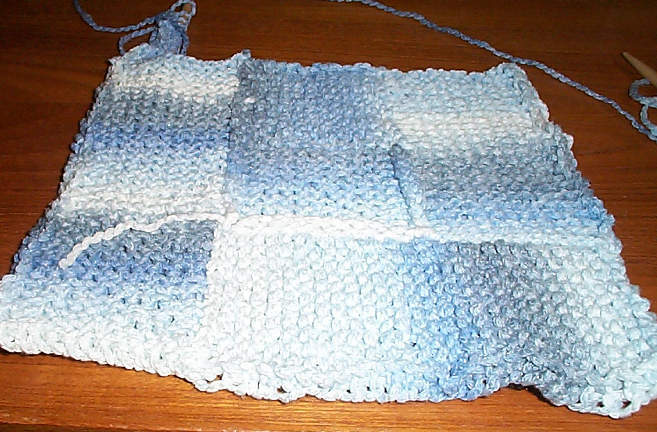 In general, I cast on 12 stitches and knit a garter square with slip stitch edges (also known as chain selvage). I left the stitches live at the top of the original square, then cast on 12 using a standard half-hitch cast on (more on this later) and knit back to the main square body. Then I knit a second square perpendicular to the first one by pulling a long loop through the next availably body stitch from the first square, and using its yardage to work each pair of rows, At the end of each right side row when I was back at the body (as opposed to the free edge) side, I’d snick up any excess length left over in my drawn loop, and do it again. Working the second square onto the live stitches of the first one totally eliminated the between-square ridges, BUT not every stitch on every side of every square is live. To continue around making strips joining onto the chain selvages would result in those join ridges – not as prominent as the ones formed by a k2tog or ssk join, but they’d still be there, even if I picked up only one leg of each chain. So I decided to end each square by casting off all except the one final stitch, and treating the cast-off row like a chain selvage row when picking up to knit on subsequent strips. That leaves only the cast-on edge (you can see where it is in the just-begun strip sticking out of the top of the work on the photos above). Half-hitch cast on makes a messy edge for picking up. I don’t like the way it looks. I’m playing right now with some of the knitting on variants, to see if they make a nicer foundation for drawn loop joining. 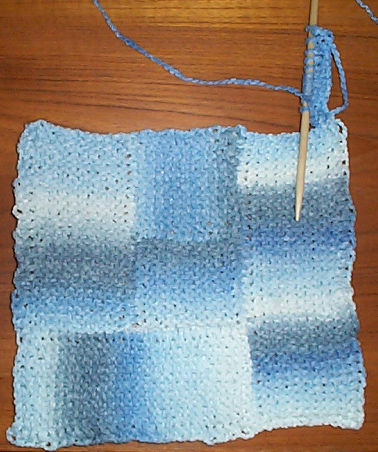 I’m not sure that I grok this well enough to explain the method better than the sketch above, but if there is interest, I’ll start taking more complete notes and consider doing a full project write-up of the Log Cabin Modular Baby Blanket here on String. You might consider using the crochet chain CO (with your working yarn, not waste yarn). It matches the standard pullover BO and should mimic your slipped st selvedges, too.